For more than two decades, ARCMTL has served Montreal’s community of emerging artists and writers, connecting them with new audiences and providing a platform for archiving their works. Established in 1998 with a dual mandate for promoting and preserving independent culture, ARCMTL has become an integral player in Montreal’s cultural milieu. Its flagship small-press fair, Expozine, showcases print publications of all kinds—books, graphic novels, zines, and more. Now in its nineteenth year, Expozine boasts some 270 vendors and 15,000 visitors, and is among the best-known events of its kind worldwide. In 2018, ARCMTL launched Volume 1 MTL, the city’s first annual fair and conference dedicated entirely to art books. The organization is also a founding partner of the Montreal Printed Art Festival. As part of this festival, ARCMTL organizes the annual GRANDE Print Art Fair, a gathering of more than 50 artists and organizations from Montreal’s printmaking and poster art community. ARCMTL’s Distroboto initiative, a unique network of small-artwork vending machines, was featured in the New York Times as an “Idea of the Year” upon its début. ARCMTL also maintains a substantial archive of local literary and artistic publications, independently produced musical and spoken-word recordings, prints, artworks, and various ephemera pertinent to Montreal’s history. 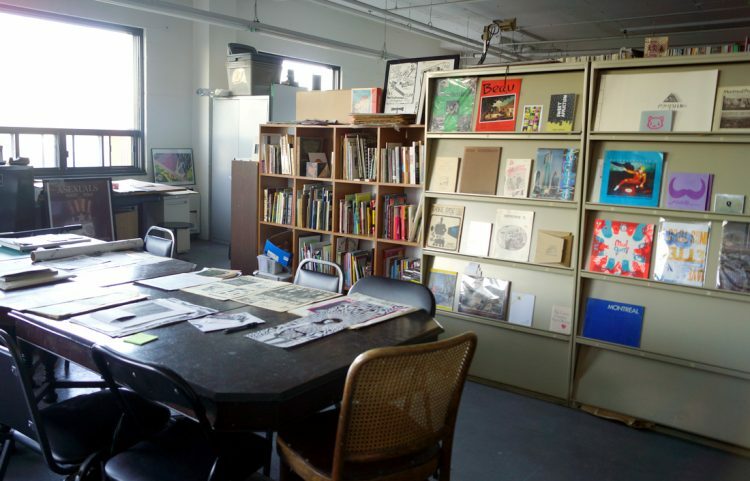 The organization’s archive centre, located in Montreal’s “Mile Ex” neighbourhood, sees intensive use by artists, curators, academic and heritage researchers, and others. ARCMTL prioritizes digitization to preserve and ensure access to fragile or rare items, and media nearing obsolescence, such as magnetic audio-visual reels, cassettes, and videotapes. More and more, digitization is essential both to preserve materials for posterity and to ensure that the collection serves the widest possible public. Among local heritage organizations, ARCMTL is a digitization pioneer, with established, effective workflows and procedures for digitizing cultural artifacts, and a wide range of these materials available online through various platforms. In the twenty years since its establishment, ARCMTL has helped grow Montreal’s cultural community and international reputation, continually expanding its partnerships with other festivals and organizations while promoting new opportunities for independent artists via workshops and conferences. In recognition of its unique contribution and impressive track record, in 2016 the Conseil des Arts de Montréal named ARCMTL a finalist for its Grand Prix award. The ARCMTL archive centre is available for consultation on appointment by researchers, students and people interested in Montreal history and culture. ARCMTL also lends material for use in exhibits and projects organized by other organizations and regularly assists projects such as anthologies, compilations, documentary film and others in finding rare material as well as rightsholders. ARCMTL also mounts its own exhibits, including an ongoing online project called Montreal Underground Origins where material from Montreal’s 1960s – 1970s arts milieu are presented. Archivist Brian Meagher and a researcher exploring Arcmtl’s unique collection of Voice of Montreal (later Vice Media) magazines. ARCMTL is an active participant in the city’s community of specialized archives, small museums, and heritage organizations, promoting its artists and archives via collaborations with partner organizations throughout the year. The organization regularly lends rare or unique materials from its considerable collection to local museums, galleries, or other institutions for exhibition purposes, amplifying and advancing its mission to broaden public knowledge and appreciation of Montreal culture. In 2017, for example, ARCMTL contributed materials on loan to the Centre d’histoire de Montréal for its exhibit (ongoing until 2019) on youth culture at Expo 67. Other regular partners include the Musée d’art contemporain de Montréal, the Canadian Centre for Architecture, the Musée des Ondes Emile Berliner, and the Bibliothèque et Archives nationale du Québec. Each year, ARCMTL engages the Montreal public directly with various cultural heritage activities. With its annual Home Movie Day, for example, Montrealers are invited to dig up their personal home movies and learn about how they may be digitized and preserved. These events also feature popular public screenings of local home movies, with neighbourhood-specific editions held in partnership with the city’s various boroughs. ARCMTL also hosts a weekly radio program, Montreal Sound Ark, on CKUT 90.3 FM, McGill University’s campus community radio station, featuring rare treasures from its audio holdings of local music and spoken word recordings. With this popular show, ARCMTL draws listeners’ attentions to a host of less well-known Montreal artists and music, while also publicizing its various events and activities. 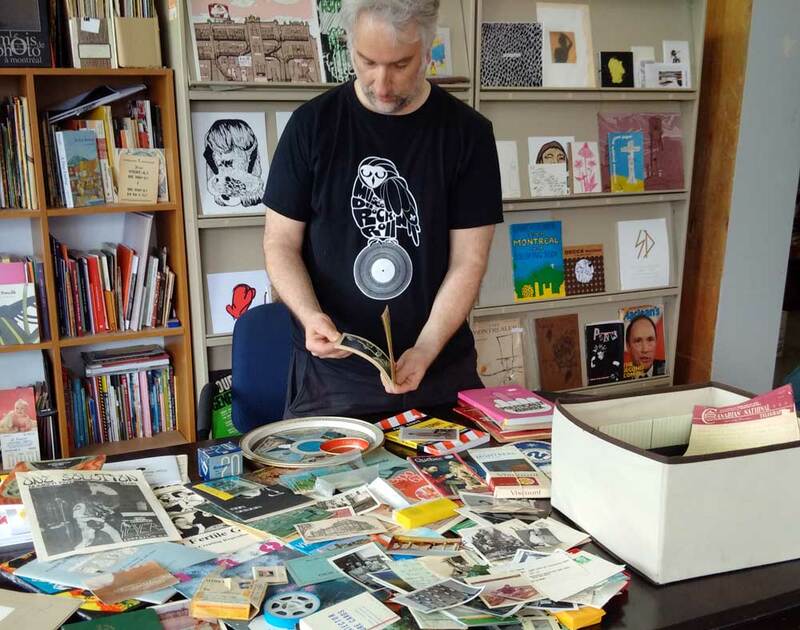 Archive Montreal’s preservation activities involve the ongoing acquisition of independently produced local cultural artifacts and publications — from books, zines, records, CDs, cassettes to more ephemeral material such as promotional posters, flyers, found footage, etc. If you have material of this kind that you don’t need anymore, we’ll gladly take your old zines, books, posters, photos, cassettes, films, vinyl etc. for conservation in our archive ! Arcmtl director Louis Rastelli sorts through an acquisition of varied ephemera. If you publish your own books or zines, print posters or other printed art, or put out local music, we could also add copies of your recent work to our collection. Catherine Cormier-Larose, Pascal-Angelo Fioramore, Naakita Feldman-Kiss, Jasmin Miville-Allard, Ashley Opheim. Janice Kerfoot, Brian Meagher, Fréd Savard, Louis Rastelli, Catherine Henderson, Philippe Garneau. Simon Bossé, Benoit Chaput, Julie Doucet, Geneviève Gosselin, Billy Mavreas, Louis Rastelli, Jamie Salomon. Carl Amabili, Andy Brown, Angela Carter, Yannick Desranleau, Ian Ferrier, Kevin Jones, Claudine Lamothe, Chloe Lum, Jeff Miller, André Racette, David Widgington. Claudia-Ève Beauchesne, Henri Bonaque, Simon Bossé, Geneviève Boyer, Benoit Chaput, Julie Doucet, Laure Fouin, Emmanuelle Fournier, Geneviève Gosselin, Gilbert Gosselin, Graham Hall, Michelle Lacombe, Kevin Lo, Billy Mavreas, Jamie Salomon.